Notes: The original Camp Centre station was built of timber sleepers but the station was rebuilt in concrete on or very close to the same location by Italian prisoners of war in 1943. 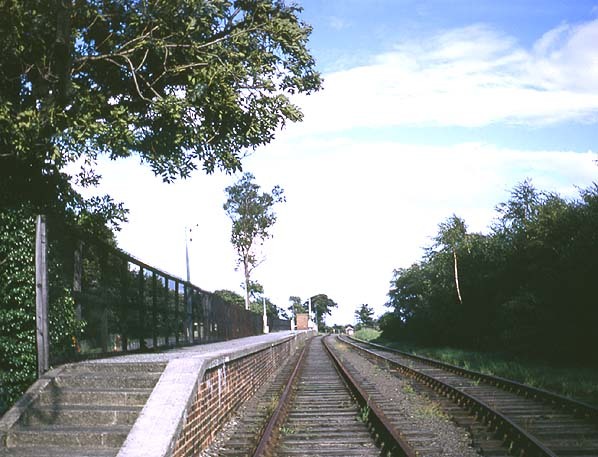 The single platform was sited on the up side of the Camp Crossing loop line facing the military hospital and was very austere in typical military style. 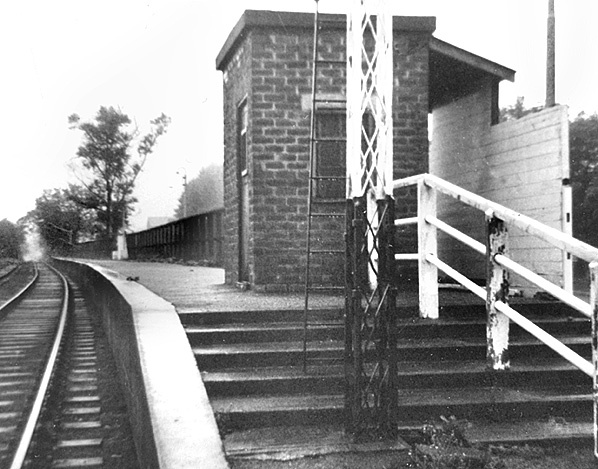 The station had a brick ticket office at the west end of the platform with stepped ramps at either end. There was a large sign on the platform stating that 'All military personnel wearing civilian clothes will show their identity cards when purchasing tickets.' The long narrow platform had a number of concrete bordered flower beds to the rear. Beyond the station there were locomotive watering facilities before the line dropped down from a low embankment and went through the middle of a roundabout on towards the terminus at California. After 1919 Camp Centre was the passenger terminus of the line. Although spartan in appearance, the station handled a large amount of passenger traffic especially during the two World Wars. All evidence of Camp Centre station was cleared away as part of a landscaping scheme between 1972 - 1978. The scheme won a civic trust award in 1978 commemorated by a plaque on a stone obelisk close to the roundabout. 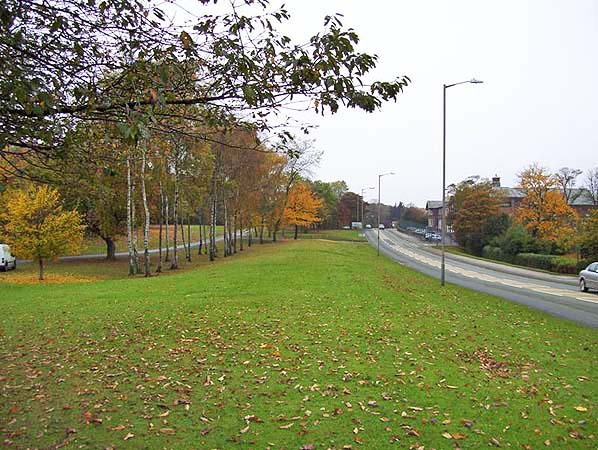 A low embankment along the course of the line has been retained as a feature. In 1841 the Great North of England Railway (GNER) opened its line between York and Darlington. In order to generate revenue from the highly profitable lead mines in Swaledale the company proposed a branch from their line to Richmond which was authorised by the Great North of England Railway Act of 21st July, 1845. Considering the main reason for building the line was to provide railhead for mining traffic it's surprising that the branch terminated some distance short of the main mining area to the west of Richmond. Prior to the line being built, lead ore had to be transported to the Stockton & Darlington terminus at Croft (adjacent to the later Croft Spa Station) and with the opening of the York line in 1841 a new railhead was established at Cowton. Before the line was built, the GNER was leased by the Newcastle and Darlington Junction Railway which had opened a line between Darlington and Gateshead in 1842. At this time the NDJR was renamed York & Newcastle Railway on 27th July 1846. The 9 mile 62 chain double track branch opened on 10th September 1846 from a junction station on the York line at Dalton, 6 miles south of Darlington between Croft and Cowton with intermediate stations at Moulton, Scorton and Catterick Bridge. Initially there were three trains each day between Richmond and Darlington with a journey time of 45 minutes. By the end of the year a fourth daily train had been added with three on Sunday. The York & Newcastle Railway only survived for a further 7 years after the opening of the line, becoming part of the North Eastern Railway in 1854. There were a number of later proposals to extend the branch west from Richmond to reach the Swaledale mines, these including the Reeth & Richmond Railway which was authorised in 1869 but no extension was ever built. In the early days, many branch trains terminated at Dalton Junction which served no community and had no road access being no more than an interchange station for the Darlington - York line. Dalton (renamed Eryholme in 1901) was an early closure losing its regular service in 1911 with all trains then terminating at Darlington and calling additionally at Croft Spa on the main line. For a time Croft Spa became the interchange station for passengers travelling south. The service on the branch gradually improved with five daily trains in 1870 and seven in 1906. A number of excursions also ran into Richmond, notably for the annual Whit Monday 'Athletic Sports and Bicycle Meet' with specials from Middlesbrough, Saltburn and Bishop Auckland and additional trains running from Darlington. The level of service remained much the same until WW1 and the opening of the 4 mile steeply graded Catterick Military Railway from a trailing connection at Catterick Bridge station to Catterick Camp two miles south of Richmond. The idea for a military camp in the area had first been proposed by Lord Baden Powell in 1908 but construction didn't start until 1914 a few weeks after the outbreak of WW1. During building of the camp, a 2' gauge contractor’s line was built from Catterick Bridge. This was completed by May 1915 and converted to standard gauge by the end of the year. Stations were provided at Brompton Road, close to Catterick Bridge Station, Camp Centre, California and Scotton. Although built to light railway standards all locomotive classes were permitted on the line which was also capable of carrying the large cross-channel railway guns used in WW2. The first soldiers arrived at the camp in October 1916 and troop traffic was immediately very heavy with seven passenger trains operating between Catterick Bridge and the camp, the last two running through to California. Five trains ran in the opposite direction with an extra train at lunch time on Saturday although no trains ran from California. On Sundays there were two trains between Catterick Bridge and Camp Centre. Some trains between Camp Centre and Darlington were combined with trains for Richmond dividing at Catterick Bridge where the camp's own tank engine was waiting to haul the detached coaches on to Camp Centre. The camp's tank engine was kept in a 2-road corrugated iron shed opened in 1915. 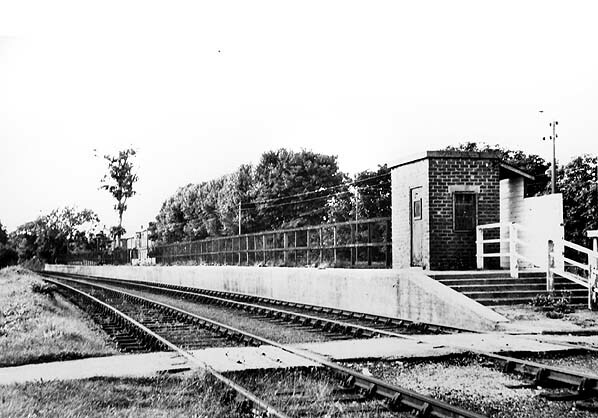 It stood south west of Walkerville Crossing and closed in c.1925. Each year until the end of the war 750,000 soldiers passed through the camp almost all of them being carried by train. Goods traffic carried by the branch was also high, increasing as the war progressed with a daily goods train with 60 - 70 wagons running every day between 1917 - 1918. After the war, the War Department decided to make the camp permanent and when the Richmond branch became part of the London & North Eastern Railway under the 1923 Grouping the running of the Catterick Military Railway was handed over to the LNER although the line was cut back to Power House sidings and California & Scotton stations were not used after 1919 and the track was lifted. In 1923 all passenger trains on the Richmond branch were worked by a locomotive from Richmond shed with the exception of the 7.55 am from Darlington and the 9.30 am return which was worked from Darlington shed. In later years more locomotives from Darlington shed were used and after Richmond shed closed on 30th December 1933 all locomotives came from Darlington. From 1st May 1933 the branch was operated by Sentinel steam railcars but by 1937 these had largely been withdrawn and only operated the Sunday service. 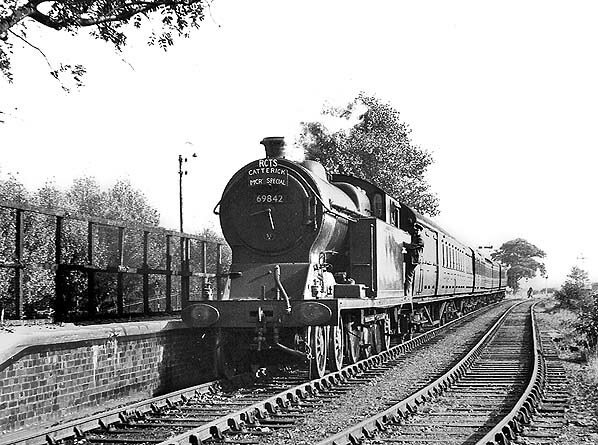 During the inter-war years there were freight and troop trains running into the camp from the main line with local and leave traffic being handled by a daily push-and-pull shuttle service running between Camp centre and Brompton Road Platform from where soldiers could transfer to the public service at Catterick Bridge, this ran until 1947. During WW2 some 'leave' trains ran through to Darlington reaching a peak of 3 - 4 on weekdays and 5 on Sundays. During this period the line was generally worked by large tank engines due to the increase in military traffic although on troop specials during and after the war virtually any class of large locomotive could appear. Between 1943 - 1946 some trains stopped at Eryholme to serve Scorton airfield near Catterick Bridge. After the war military traffic was in decline with only weekend 'leave' trains and a daily goods service and by the late 1950s there was just a Friday afternoon departure for Newcastle and a Saturday lunchtime departure for London with three early Monday morning trains returning to the camp from Darlington. By the late 1950s, the Richmond line was operated entirely by DMUs with 12 daily trains and an extra one on Mondays and Saturdays and three on Sundays but BR claimed that the branch was running at a loss. On 10th October, 1963, the North Eastern Region of British Railways gave notice of their intention to withdraw all passenger services, (except certain military trains), between Darlington and Richmond. Following objections, the proposal was rejected and trains continued to run although passenger services to the camp ended on 26th October 1964 although 'leave' trains continued to run to Catterick Bridge station for a little longer. The last steam train to visit both the Richmond branch and the Catterick Military Railway was the 'Three Dales Railtour' on 20th May 1967. A second proposal for closure was submitted on 26th January, 1968, once again objections were made, but on 11th December, the Minister of Transport gave his consent to closure subject to the introduction of a suitable replacement bus service. BR announced that passenger services to Richmond would cease from 3rd March, 1969, goods traffic having already been withdrawn from Richmond on 2nd October 1967. Prior to the second closure application, BR had singled the line from a point 246 yards west of Catterick Bridge station to Richmond. This section was then worked under the ‘one engine in steam’ arrangements. 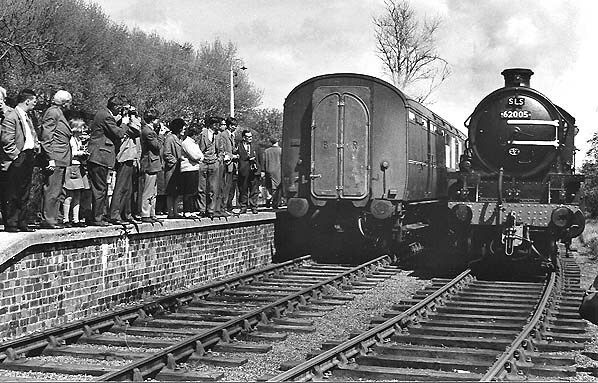 The line between Catterick Bridge and Richmond closed completely on 3rd March, 1969. By this date the Sunday service had already been withdrawn so the last train actually ran on Saturday 1st March. Freight traffic to Catterick Bridge continued to run until 9th February 1970. Track lifting started later that month and was completed by October 1970. Croft Spa, Eryholme, Moulton, Scorton & Richmond. 1:2,500 OS map shows the layout of Camp Centre station in 1932. 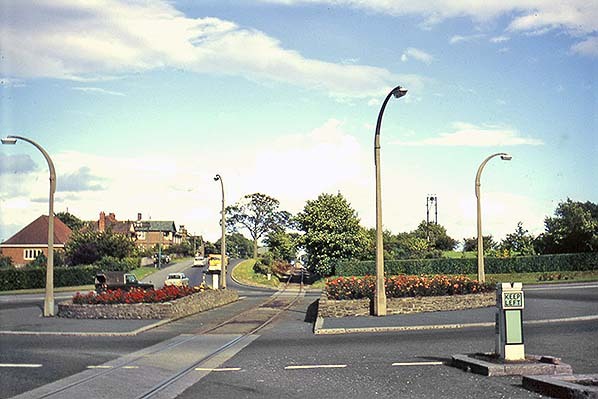 In later years the sidings to the south of the station were removed and a roundabout was built at the west end of the station with the railway running through the middle of it. Click here to see a larger version. 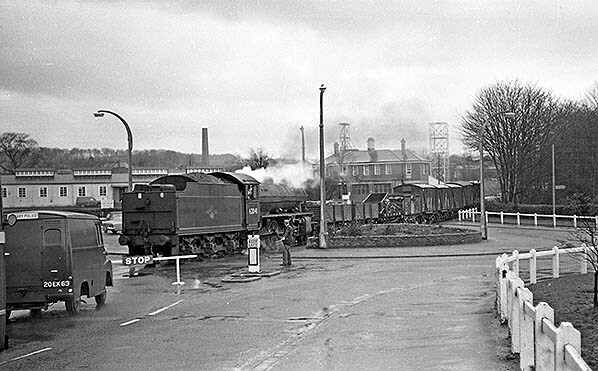 K1 62041 is seen crossing the Camp Centre roundabout in the 1960s. This Thompson 2-6-2 was built in October 1949 at the North British Locomotive Caompany in Glasgow. She was withdrawn from 51C West Hartlepool shed on 30 April 1967 and was cut up at Drapers in Hull five months later. embankment can just be made out. On 11 December 2018 a memorial was unveiled in the middle of the Camp Centre roundabout marking 100 years since the Armistice. 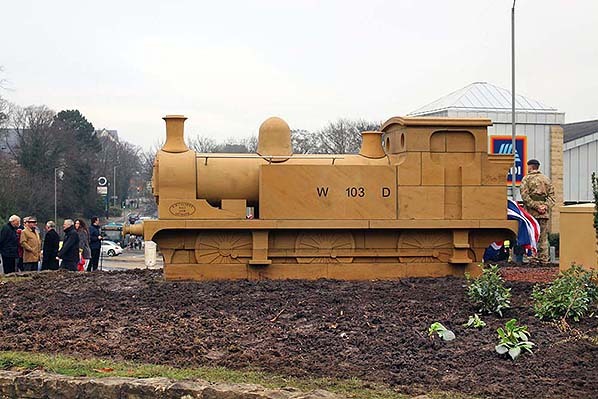 The locomotive will stand in memoriam for the tens of thousands of soldiers who disembarked from trains at the camp before entering training for the trenches during the First World War.